We are officially in countdown mode, with the Super Bowl a week away. So if you have been following me for a while, you know that football is big in our house, mainly because my hubby is obsessed. He doesn’t miss Monday night, Thursday night, or Sunday football. So you know we go big when the Super Bowl rolls around. And I don’t know about you, but whether you are cheering on the New England Patriots or the Los Angeles Rams, it’s all about the FOOD. Seriously, what is the Super Bowl without a big assortment of appys to munch on? 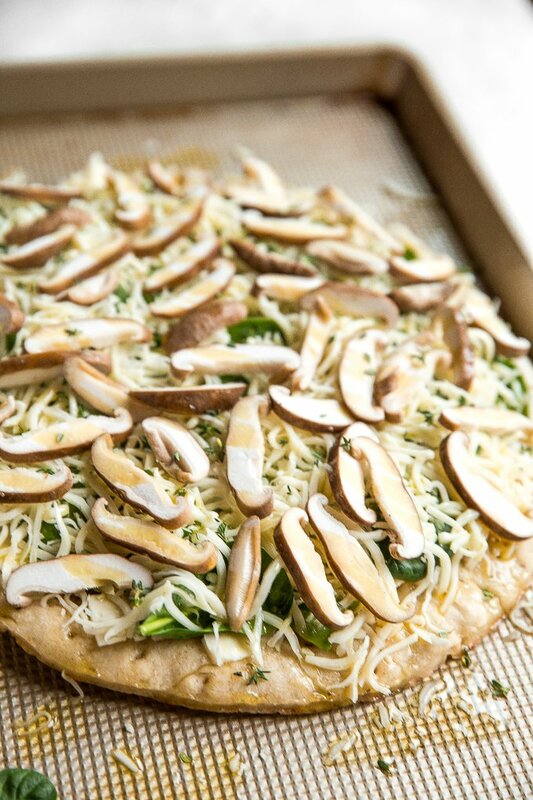 So this year, we are adding a new option to the menu — mushroom and spinach flatbread. 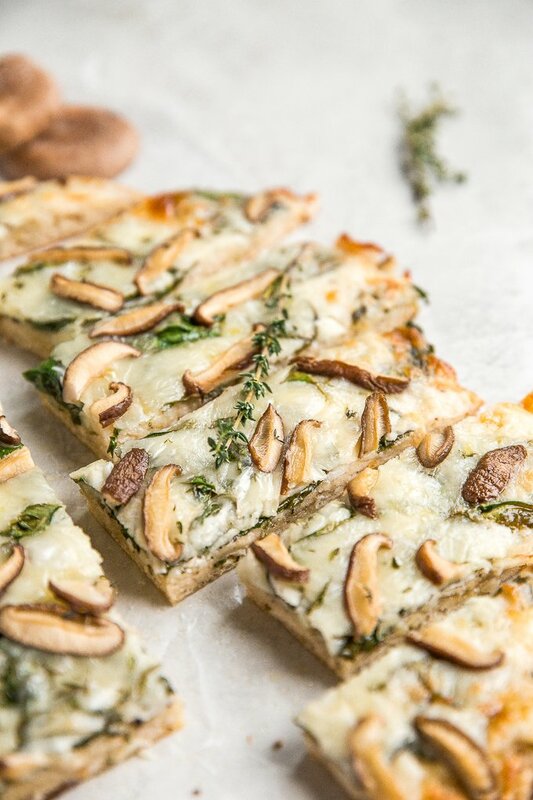 This flatbread is loaded with fresh shiitake mushrooms, a few generous handfuls of baby spinach, and some truffled fontina cheese. In other words, it’s heaven. Fontina is great because it melts beautifully, and the truffles compliment the already earthy flavors of the shiitakes. It literally tastes like heaven on a plate. But of course you can switch up these ingredients for any alternatives if you don’t have these on hand. For instance, if you don’t like shiitake mushrooms, use any type of fresh mushrooms. Can’t get your hands on some truffled fontina cheese? Use any melty cheese as an alternative. The best part of this meal is that it is ready in less than 30 minutes!! Seriously, nothing beats this when you are busy with a million other things when getting ready to entertain guests. But that also means that you can, and should, make this on a weeknight to get dinner on the table stress-free! Plus, buying a pre-made flatbread will make your life so simple, and these days the options I can find in my local store are plentiful. 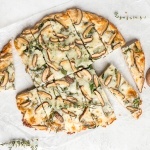 Serve this mushroom and spinach flatbread with fresh thyme (trust me, thyme and mushrooms are perfection). And perhaps consider making two of these at a time, because they are simply that addictive. And the leftovers? Perfect for a lazy breakfast topped with a fried egg! 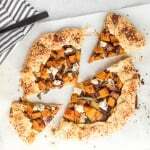 This flatbread is the ultimate umami flavor bomb, and will leave you completely satisfied and longing for more. 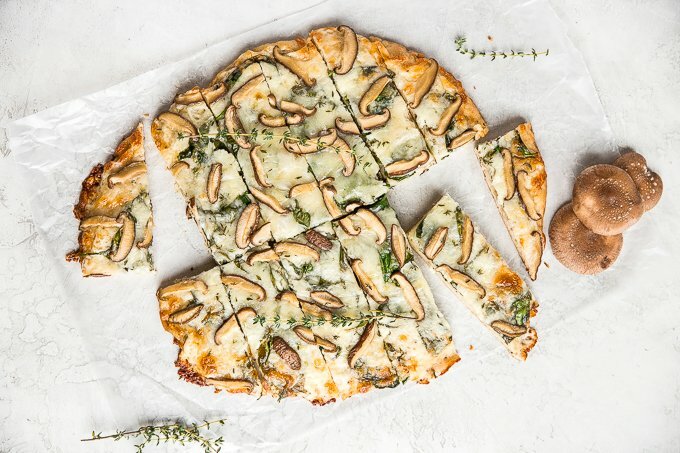 Mushroom and spinach flatbread is heaven on a place. 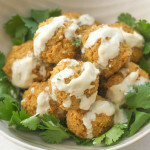 It is ready in under 30 minutes, making it a life-saver game day meal or weeknight dinner! 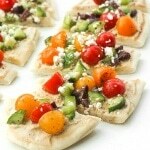 Preheat oven to 425 F. Place uncooked flatbread on a rimmed baking sheet, then drizzle with 2 tablespoons olive oil. 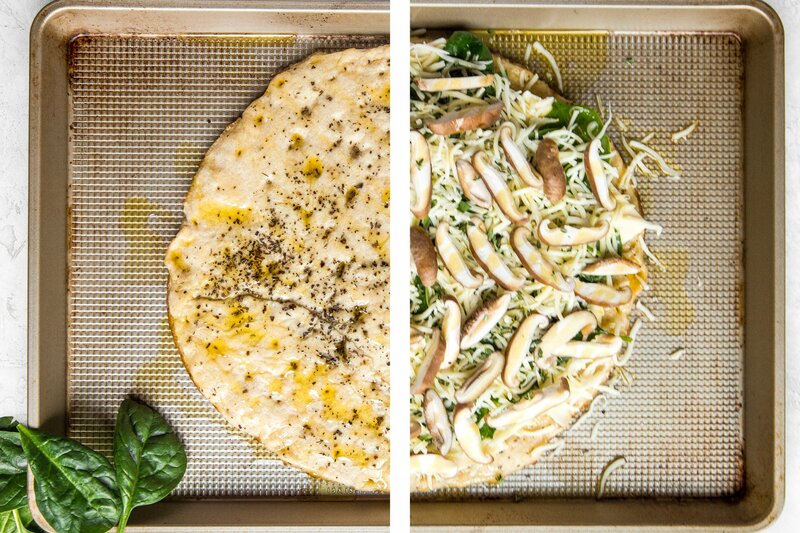 (If using a flatbread with no herbs on top, you can sprinkle 1 teaspoon Italian seasoning on top at this point). 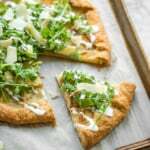 Scatter taleggio or fontina (or other cheese) evenly on top, then add baby spinach. Top with shredded mozzarella and shiitake mushrooms. Drizzle with another tablespoon of olive oil. 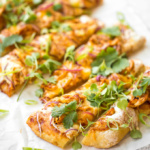 Bake for 12-14 minutes, or until flatbread is crispy on the bottom and cheese has melted and browned a little on top. Let cool about 5 minutes before slicing. Serve topped with fresh thyme.